Beyoncé Knowles has once again put rumours to rest her marriage is on the rocks. The diva and rapper Jay-Z have been subjected to reports for months they're headed for a split as soon as their On the Run Tour ends in September, despite putting on a united front on stage. The gossip reached a fever pitch this week after the New York Post reported Beyoncé was spotted house-hunting with the rapper nowhere in sight. But Bey appears to be more in love than ever with her spouse of six years, and took to Instagram on Tuesday, seemingly in a bid to shut down the gossip once again. 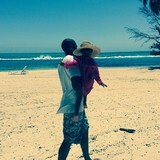 'My favorite hue is JayZ Blue,' she captioned an image of the rapper walking along the beach, with their daughter, Blue Ivy, in his arms. As MTV News reports, the message also quotes a lyric from Jay's 2005 single Go Crazy. Beyoncé has been known to address rumours with cryptic Instagram messages in the past. Earlier this year, following a highly-publicised physical altercation between the star's sister, Solange Knowles, and the rapper, Bey posted several photos of herself with her sibling on the photo-sharing app. Beyoncé's latest post follows on the heels of reports she scoped out a 4,045 sq ft, $21.5 million apartment in the Chelsea neighbourhood of Manhattan last month. 'She was very quiet, as if she was looking on the sly,' a source told the Post. 'There's no way a $20?million apartment is for her mother or her sister. That would be wildly unlikely,' the source said. The superstar couple currently reside in an 8,309 sq ft home in Tribeca with their two-year-old daughter. A spokesperson for the pair had not commented publicly on the latest claims at press time.